That’s a 7-5 basketball player dunking on a much smaller high school kid and trying to wrap his legs around him to further humiliate him. That’s funny. Unfair? Bullying? Not really because that 7-5 player is also in high school, so he can dunk on as many high schoolers as he wants. Isn’t that what we teach in our fair and democratic society — dunking on people our own age? 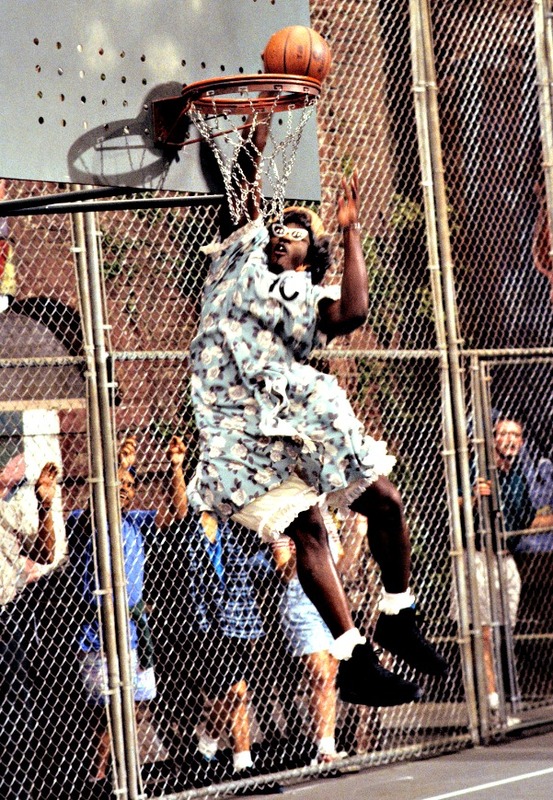 Babies should only dunk on babies while grandmas dunk on grandmas (unless you’re Larry Johnson in old woman’s clothing). The point is that even in this post, there’s a lesson to be learned. That height-unchallenged high school kid’s name is Tacko Fall and he’s originally from Senegal. His dream is to become the tallest biochemist in the world minus the tallest part. His backup plan is to play in the NBA where he hopes to continue dunking on men his own age. Until then, watch Tacko dunk on middle schoolers.